Crispy, crunchy with the classic German Chocolate flavors of coconut, pecans (except I use Almonds) and chocolate that is so over the top you’ll think you’re sinning when you eat this. German Chocolate Granola is life changing! Seriously, you’re gonna WANT to wake up, just to have this for breakfast. Well, almost, anyway. German Chocolate Granola tastes like absolute decadence. It’s so chocolatey, so delicious. There’s a bonus, though. When you’re done with your cereal, guess what? You have chocolate milk to drink! I love that! In reality, if you buy the idea that a little dark chocolate is good for you (I do! I do!) German Chocolate Granola is on the healthier side of most cereals and on the healthier side of many granolas. And yes, there is some actual chocolate in the recipe, but the majority of the chocolate flavor comes from cocoa powder. When that powder is heated as the granola toasts, it becomes rich and toasty, too. So at this point of the recipe, you can feel pretty darned virtuous…you haven’t actually sinned…yet. It’s when the granola comes out of the oven and you drizzle it with dark chocolate (I used a German chocolate) that the sinning part comes. But if you’re like me, you probably won’t care once you taste it. Because you’re going to be in your own little heaven. 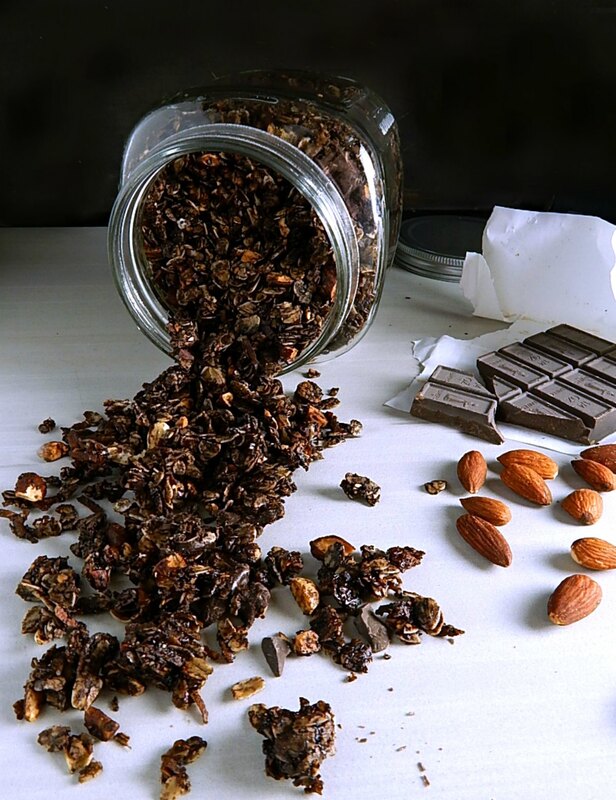 Besides, it only takes just a hint of chocolate to take this granola over the top. Just a few ounces. Four to six, which isn’t much per serving. But because that chocolate is drizzled all over the top of the granola, you’ll get a little bit in every bite. German Chocolate Granola is so good, you won’t even *think* about it being healthy. It’s light, it’s crispy, it’s crunchy & chewy at the same time. And it is sooo chocolatey! You’ll just want to keep munching on it. But go easy and remember that anytime you’re using a dried fruit like coconut you’re eating concentrated flavor. This recipe is heavy on the nuts, too, which aren’t low calorie even though they’re so good for you. I try to “formulate” my granolas so a serving gives me the 10 almonds I want to eat every day. Next time I make this recipe, I might either double everything except the almonds or half the amount of almonds and leave everything else the same. I seriously had a hard time limiting myself to one serving. As far as cost, oats are really dirt cheap (and healthy, too!) and I used the Quaker Old-Fashioned, and more recently the Aldi brand. Oats are generally on sale in the early fall and that’s when you’ll find coupons. Supply & demand, right? The harvest’s over and the warehouses full. Stock up, because the new harvest won’t start coming in until the following May. Coconut is another holiday sale item, usually cheapest around Christmas and New Years. Use your coupons. Keep it tightly sealed in the freezer inside a second bag like another Ziploc; it doesn’t freeze solidly, so you can usually measure with no problem. It not, leave it on the counter for a few minutes. I rarely find sales on actual baking chocolate, but I do sometimes (if I’m feeling strong!) pick up good chocolate after Halloween, Valentine’s Day and Easter. Valentine’s day seems to be the holiday when the best chocolate is on sale. Notice my chocolate in the photo – you might see it’s not perfectly shiny and has some dullness. When chocolate has been sitting in less than ideal situations (like in my house while I was in South Dakota helping out the folks, which had lots of temperature fluctuations) in can develop a “powdery” or whitish look called bloom. It has just gone out of “temper” and is still perfectly good to use but might be a little crumbly to eat. Read more about it at Amano Artisan Chocolate. If I’m not using a good chocolate I often use chocolate chips, which do often go on sale! In a small bowl add coconut oil and honey. Heat in the microwave in 30-second increments, stirring until melted. Add cocoa, salt & extract of choice and whisk until well combined. To a large bowl, add oats, coconut, and almonds. Mix, then drizzle with the honey mixture and mix again until all is coated. Turn out onto two sheet pans. Gently press with a flat-bottomed cup (spray the bottom with cooking spray if desired) until mixture is evenly flattened and compressed. Bake 18 to 20 minutes until granola is golden brown, rotating the cooking sheet(s) halfway through. When cool, drizzle with the melted chocolate. Put sheet pans in the refrigerator until chocolate has hardened. Use a spatula to loosen the granola from the sheet pans, breaking into chunks. Stores well for two to three weeks in an airtight container, preferably in the refrigerator; for longer storage, freeze. Take a nibble or two of the mixture after mixing and before pressing so you can decide if you’d like to alter any of the ingredients. I’ll be sharing my German Chocolate Granola at Fiesta Friday #233. Stop by to checkout all the links and stop by again on Tuesday to vote on your favorite ones! This entry was posted in Click here for Bargain Meals, Click here for Fabulous Food Posts and tagged Almonds, Breakfast or Brunch Dish, Chocolate, Coconut, Coconut oil, dried coconut, Dried Fruit, German Chocolate, Granola, Nuts and Seeds, Oatmeal, Pecans. Bookmark the permalink. Oatmeal for life! And if it’s granola? Even better! German chocolate granola?! Best yet! You are definitely doing life right! Lol, and thanks Carlee~ it was so good! I’m getting addicted to my granolas and my next is going to be Banoffee Pie!! Caramel and Banana! Yummy! We love granola here and this one sounds totally delicious! Thanks for bringing it over to the Fiesta! Sorry to reply so late! Thanks, and I’ve been going through a granola resurgence! I can’t seem to get enough of it. Granola and coconut yogurt 😍 with freshly picked blackberries and blueberries 👍🏼That’s what I’m eating in this hot weather. Thank you for this super simple recipe! Thanks, Anne! I wasn’t sure if you meant make it so you’ll have it when your Granddaughter visits or make it so you can have it before she gets there! I recommend both, lol!! I’m thinking your German Chocolate Granola Yogurt Parfait would make for wonderful evening snack! Thanks, and yes it would! I often like a little something at night!